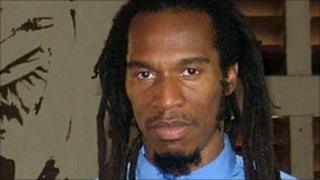 Campaigners for the AV voting system have been accused of "airbrushing" black poet Benjamin Zephaniah out of leaflets sent to parts of the country. The "Yes to AV" campaign used his picture on literature used in London but featured another supporter - the actor Tony Robinson - in other parts of the UK, the Sunday Telegraph reports. The "No" campaign said its rival was "ashamed" of the poet's backing. But the "Yes" campaign called the allegation "a new low". It said it varied the celebrity backers featured on its leaflets as there were "a number" to accommodate. Yes to AV's literature urges people to support a switch from first-past-the-post Westminster elections to an alternative vote in the nationwide referendum to be held on 5 May. Celebrities Joanna Lumley, Eddie Izzard, Colin Firth, Honor Blackman and Stephen Fry appear on both sets of leaflets shown by the Sunday Telegraph. At the moment MPs are elected by the first-past-the-post system, where the candidate getting the most votes in a constituency is elected. On 5 May all registered UK voters will be able to vote yes or no on whether to change the way MPs are elected to the alternative vote system. Under the alternative vote system, voters rank candidates in their constituency in order of preference. Anyone getting more than 50% of first-preference votes is elected. If no-one gets 50% of votes, the candidate with the fewest votes is eliminated and their backers' second choices allocated to those remaining. This process continues until one candidate has at least 50% of all votes in that round. In London a picture of Mr Zephaniah is reportedly included, with the poet quoted demanding an electoral system that "makes everyone's vote count". But in near-identical leaflets, reportedly sent to locations including Sussex and Cornwall, he is apparently replaced by Mr Robinson, the star of the BBC comedy Blackadder and the Channel 4 archaeology show Time Team. Terry Paul, a spokesman for the NO to AV campaign, said: "Why are Yes to AV ashamed to have the support of Benjamin Zephaniah in places like Cornwall and Hampshire? "The Yes campaign's leaflet offers a chilling preview of politics under the alternative vote. "We have warned that AV would encourage parties to pander to extremist opinions in a chase for second and third preference votes, but we never imagined the first example of such outdated views would come from the Yes campaign itself." A Yes campaign spokesman said: "These allegations mark a new low for the 'No' campaign and their increasingly desperate smears. "Let's put it this way: Operation Black Vote, the Muslim Council of Britain and a host of similar groups are backing the 'Yes' campaign. The BNP are backing the 'No' campaign. People can draw their own conclusions."